(for more details see: G.P. Smith, J.P. Kneib, H. Ebeling, O. Czoske, I. Smail, 2000, ApJ, submitted. "An HST Lensing Survey of X-ray Luminous Galaxy Clusters: I. A383"
Abell 383 is not one the most famous Abell clusters, yet it is one of the most X-ray luminous clusters at z~0.2. It has therefore been selected with 11 other clusters to be studied in detail using the best instruments and telescopes currently available. The more X-ray luminous a cluster is, the more massive it should be, and therefore the most spectacular gravitational lensing effects on the faint background galaxies should be produced by the most X-ray luminous clusters. Abell 383 fulfills this expectation and shows beautiful gravitational arcs and arclets. Indeed, because of its massive core Abell 383 is distorting the geometry of Space-Time locally, and the background galaxies seen through that cluster are distorted and amplified by this imperfect lens. 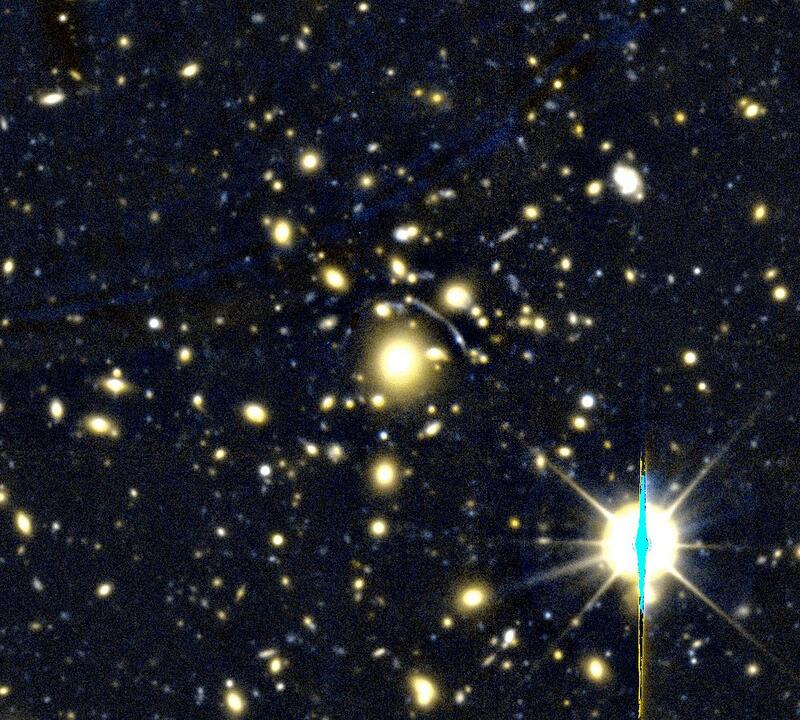 In the image, the cluster galaxies appear with yellow color, and the background galaxies have a more blue-ish color. Many of them are visibly arc-shaped, one being especially spectacular close to the center of the image, to the top right of the central galaxy. But many others can also be distinguished all around. (Have a look at a previous image of Week on Gravitational lensing caused by another Abell cluster, Abell 370). At larger distance from the cluster center the distorsion induced by the cluster is becoming weaker and weaker, but because the number of faint background galaxies is increasing it is still possible to study the radial profile of the mass distribution out to the periphery of the cluster. It thus allows astronomers to measure the total mass properties of these large bound structures, to compare their mass distribution to the intra-cluster X-ray gas distribution as well as numerical simulations, and thus to draw conclusions on the structure of the Universe as a whole. This color image was made from the B and R-band observations of the cluster of galaxies Abell 383 using the CFH12k camera during the nights of November 14-16, 1999. Total exposure times of 7200sec and 6000sec accumulated at 8 and 10 dither positions respectively, were acquired in the B and R bands. The seeing quality of these images is good: 0.7 arcsec (FWHM). The region shown is only the central 3.3 x 3.3 arcmin2 of the total field of view of 40 x 30 arcmin2 of the CFH12k camera. A few reduction artifacts are left in the image and should not be confused with gravitational arcs. At bottom left, there is a bright and saturated star. The blue linear streak expanding away from its center is the "bleeding trail" of the detector. This is a common, well-known phenomenon due to the nature of the electronic CCD detectors. This feature is an artifact. Also, on the top left part of the image, large faint trails are visible in dark blue. They are not gravitational arcs although they have a curvy shape. They are leftovers from the data reduction process. Copyright © 2000 by CFHT. All rights Reserved. CFHT is funded by the Governments of Canada and France, and by the University of Hawaii.